While preparing the 1901 Spalding’s Guide for printing, I noticed that some future Carlisle players could be found in two photos on page 167. The first photo was of the 1900 Haskell Institute team but was mislabeled as being “Haskell Indian College,” in much the same way as Carlisle Indian Industrial School was often referred to as Carlisle College. Perhaps the whites who elevated these government Indian schools to collegiate status felt embarrassed that the Carlisle and Haskell Indians routinely defeated teams from the elite schools with players who had less education, money or experience playing football. The first names to register with me were Archiquette and Guyon. I already knew that Chauncey Archiquette, captain of the 1900 Haskell team had played for Carlisle prior to coming to Haskell. He again played for Carlisle after returning from Haskell a few years later. I also knew that Charles Guyon played for Carlisle after enrolling there in 1905. However, as a joke, he went by the name Wahoo. The list of players’ names under the photo included some other familiar ones but they weren’t Carlisle stars; they were Haskell players who battled against Carlisle in the 1904 St. Louis World’s Fair game and later transferred to the eastern school. Steckbeck identified DuBois as another Haskell player who transferred to Carlisle along with several others who were on the 1904 team but not on the 1900 team. However, there were some players on the 1900 Haskell team that were also on the 1904 edition: Oliver, Felix, and Payer (or Payor). Immediately below the Haskell photo is the Fort Shaw Indian School team photo. The person sitting in the first row, far left is Burd. Sampson Bird, captain of the great 1911 Carlisle team attended the Fort Shaw school before coming east, so this is probably him in the photo. An Indian agent probably spelled the name with a “U” instead of an “I” because the Burd family name was known to many. I thought I’d continue with the theme of Carlisle Indians who played football in WWI by looking through the 1919 Spalding Guide for references to the Carlisle team or its players. Before starting that, I checked to make sure that I hadn’t done it before as my memory isn’t as good as it once was. In January of this year, I did a piece about the Carlisle students whose names I wasn’t familiar with who were playing on military teams. I recollect having mentioned that, although the 1918 Spalding Guide included Carlisle’s schedule for that year, none of these games were played because the school was closed shortly before the beginning of the football season in 1918. Fortunately, some names I do recognize can be found in the 1919 book, too. Om page 22 is the photograph of the 1918 Georgia Tech “Golden Tornado.” Joe Guyon is #8 and John Heisman is #12. Charles Guyon (Wahoo) isn’t in the photo. Perhaps, Heisman got rid of him by then. 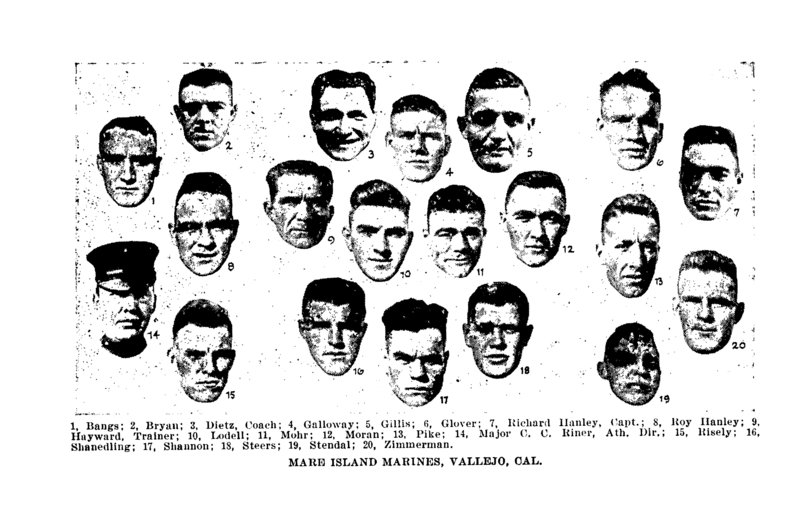 Page 188 displays headshots of players and coaches for the 1918 Mare Island Marines team. Lone Star Dietz, #3, coached this team composed mainly of his former Washington State players. So may of them were on this team that this photo was published as part of the Washington State yearbook for that year. The New Year’s Day game in Pasadena on January 1, 1919 was the second one for those who had also been on the 1915 Washington State squad that had played in Pasadena in 1916. Page 263 includes a write up for the Base Section No. 5 team from Brest, a major port of embarkation: “On January 19, 1919, a Base foot ball squad was organized under Lieut. W. C. Collyer, former Cornell half-back. This squad was composed of the above mentioned engineers, together with several stars gathered together from different outfits. Of these, the most prominent was Artichoke, a former Haskell and Carlisle Indian star.” Not being aware of anyone named Artichoke, I am confident that the player in question was Chauncey Archiquette, Jim Thorpe’s early idol. Unfortunately, a team photo wasn’t included to see that Artichoke was indeed Archiquette. The program stated that every one of the players was a full-blooded Indian, but we doubted it in the case of one man with curley [sic] hair, and in the case of another who formerly played with the U. W. [University of Wisconsin–Madison] team and at least made no claim of Indian ancestry at that time. Most of them really were Indians, though they didn’t look the part except when they wrapped themselves in red blankets waiting to begin. It is well known that a number of the Haskell players later enrolled at Carlisle, but not so well known that some players played on major college football teams before or after playing for Carlisle or, in a few cases, both. I haven’t figured out which University of Wisconsin player the newspaper reporter had in mind yet. The only player on the 1903 Wisconsin squad that I know for sure played for either Carlisle or Haskell was William Baine. But he didn’t play in the World’s Fair game. However, two former University of Minnesota players played for their old alma mater, Carlisle. Perhaps, the writer confused players for his neighboring state’s team with those of his home state. Ed Rogers and John B. Warren both played for Minnesota in 1903. Rogers played for Carlisle from 1897 to 1901 before enrolling at the University of Minnesota law school. John B. Warren eventually came to play for Minnesota but by a more circuitous route. The April 22, 1904 edition of The Red Man & Helper included an article about him that included his football history. He played for Carlisle in 1898 and 1899. After graduating in 1900, he enrolled at the Indiana Pa. Normal School where he continued to play football in 1900 and 1901. He enrolled at Minnesota in 1902 and lettered at right tackle. In 1903, Warren shifted to right guard and Rogers was elected captain of the Minnesota squad. 1904 found both Ed Rogers and John Warren working as football coaches. Rogers coached at Carlisle and Warren was hired as coach and athletic director of Chilocco Indian School. Because Chilocco played a major role in the operation of the model government Indian school exhibit at the World’s Fair, Warren and his athletes spent the summer at the Fair, most likely playing baseball. He could have easily made contact with Haskell officials that summer and fall. On the Saturday after Thanksgiving, Rogers suited up as a player for Carlisle and Warren donned the moleskins for Haskell. Delaney went on to declare Haskell a better team than his St. Louis U. team: The title of Champions of the Southwest must unquestionably be conceded to the Haskell Indians. Their record is as follows: they defeated Texas, 4 to 0; Kansas, 23 to 6; Missouri, 39 to 0; Washington [of St. Louis], 47 to 0; Nebraska, 14 to 6. 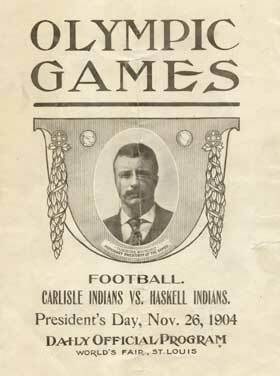 They were beaten at the Stadium by the Carlisle Indian team, score 38 to 4. Next thing of interest to us in Delaney’s column was the selection of his picks for All Southwestern Eleven first and second teams. Haskell players stood out there as they had as a team. He placed DuBois at right tackle, Fallis at quarter, and Pete Hauser at right halfback on his First team. Two more Fighting Indians made his Second Team: John Warren at left guard and Chauncey Archiquette at right halfback. Please note that sports writers of that day took liberties when assigning players to backfield positions on their All Star teams. It wasn’t unusual, for example, to see someone who played halfback put in the fullback position if he thought that halfback was better than any of the fullbacks that year. Delaney not only selected players but provided some rationale for picking them: Right Tackle should go to DuBois of Haskell Indians for ability and experience. Left Guard—Warren of Haskell seems to be the most likely man for substitute and plays an unusually good game. Center—The best fight seems to be here, for there are three men about equal in Michelson of Kansas, Prugh of Rolla and Felix of Haskell. [He said nothing more about Felix and didn’t put him on either first or second team.] Quarter-backs—this year who have gained considerable notice are Fallis of Haskell Indians and Pooler of Kansas University, they both being very good in a broken field. Fallis seems to have the edge on Pooler in speed and is an expert dodger, good on running back punts and is a sure tackler. His ability to size up a play, his grand leadership and control of his men, combined with his coolness in action, makes him the man to lead the team. Right Half-back—unquestionable belongs to P. Hauser of Haskell with Archiquette of Haskell, his team-mate, substitute, they being so nearly matched that only after some time was P. Hauser selected. Both played hard, brilliant football, and it was their work that won for Haskell Indians the Southwestern championship. Archiquette is better running back punts and on a broken field, while Hauser is very fast running with the ball, a good line bucker and end runner, and plays a harder and more consistent game than his team-mate…. The back-field consists of careful, fast and heavy players, not easily drawn from their positions and unusually good in bracing up a line. All are good punters, excellent dodgers and sure handling punts. Everything considered, this is easily the best team ever representing the All Southwest. It is well known that Carlisle Indian School shellacked Haskell Institute at the 1904 St. Louis World’s Fair on the Saturday after Thanksgiving. What isn’t widely known is that the St. Louis University team was deemed the Olympic Champions that year by virtue of playing, and winning, all their home games at the fair site which doubled as the location of the 1904 Olympics. The 1905 Spalding’s Guide includes a photo of the team titled “St. 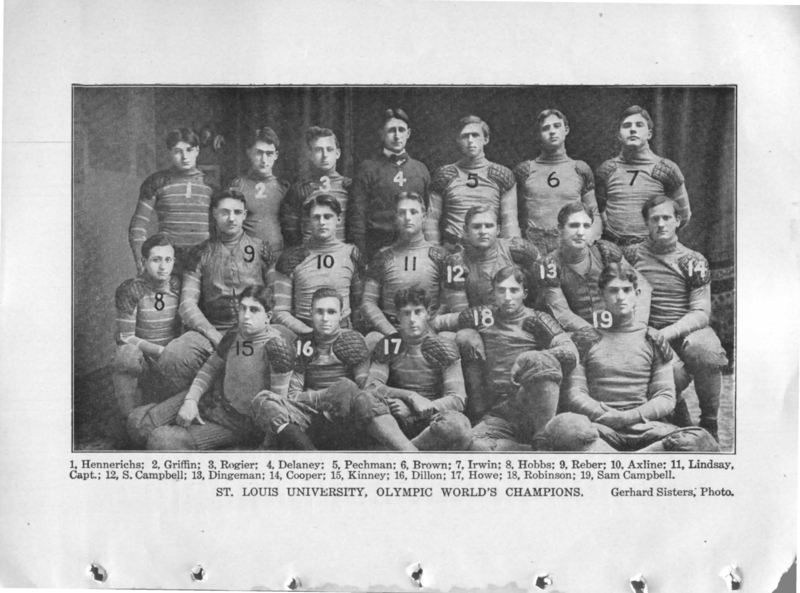 Louis University, Olympic World’s Champions.” While the pre-Billiken St. Louis U. footballers went undefeated, untied, and unscored upon through their eleven-game schedule, they were probably not even the second or third best team to play in front of an Olympic audience that year. The only major schools played were Kentucky, Arkansas and Missouri. During the season of 1904 football in the Southwest received a stimulus which did more to develop the game in this section than ten years of independent effort on the part of the various teams could possibly have done. This stimulus was given by the Physical Culture Department of the Louisiana Purchase Exposition. The department took charge of the schedules of St. Louis’ principal teams—those of Washington and St. Louis Universities—furnished them grounds, and brought the best teams in the section to meet them. As a consequence, these teams and the teams who played them had a season of unexampled success and development. Ed Rogers and James Phillips weren’t the only Carlisle Indians to play for a future Big Ten team in 1903. Player #4 (players on team photos in Spalding’s guides are conveniently numbered for the ease of the reader) on the University of Wisconsin team photo on page 20 is William Baine. He played for the Indians from 1899 to 1900, then returned to Haskell Institute to play before enrolling at Wisconsin in 1903. Prior to coming to Carlisle, Baine had played for Haskell and its cross-town rival, the University of Kansas. While at Carlisle, William was enrolled in Dickinson College Preparatory School. The photo of the 1903 Macalester College team on page 68 includes Lone Star Dietz as player #11. Dietz played for Friends University part of the 1904 season but a Friends team photo is not to be found in the 1905 Spalding’s Guide. Dietz enrolled at Carlisle in 1907. It isn’t clear what he did during the 1905 and 1906 seasons. On page 123, Archie Rice, Sporting Editor of the San Francisco Chronicle, named Weller of Stanford as fullback of his 1903 All-Pacific eleven but mitigated that with his next sentence: “There is a possibility that Bemis [sic] Pierce of the Sherman Indians, but formerly of Carlisle, might be more valuable for the team than big Weller….” When Pierce left Carlisle for Sherman Institute in Riverside, California, the Carlisle school newspaper reported that he was to coach that Indian School team, but it appears that he also donned the moleskins to get into the action as a player. 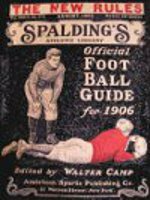 That the 1903 season results and team photos for both Haskell Institute and Sherman Institute were omitted from the 1904 Spalding’s Guide is unfortunate. 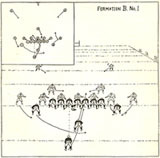 According the David DeLasses’ www.cfbdatawarehouse.com, Sherman Institute went 4-4 in 1903 with a win over Southern Cal and losses to Stanford and Carlisle. That site has Haskell Institute going 7-4 with wins over Texas, Kansas and Missouri and losses to Nebraska, Chicago and Kansas State. The 1905 Spalding’s Guide has a lot more about Haskell. The on-field influences the government Indian schools, Carlisle mostly but also Haskell to some extent, had on the development of college football are well known. Less well-known are the impacts on the rules under which the game is played. Most football historians are aware that Carlisle Indian School was frequently criticized for not adhering to eligibility rules similar to those agreed to by the major colleges. In 1908, Pop Warner instituted a limit of four years of eligibility on the varsity team for Carlisle’s players. Years spent riding the bench without playing were most likely not counted against the four years. Something that is not known as well is that major colleges routinely ignored the fact that players they recruited from Carlisle had already played for four years prior to enrolling in college. That was about to change in 1905 if some had their way. A November 29, 1904 article datelined Chicago that was printed in The Boston Globe announced that eligibility rules were about to be enforced more stringently, at least by some schools. “A meeting of representatives of leading western colleges” (read Big Ten) agreed on rule changes to which they were to comply. 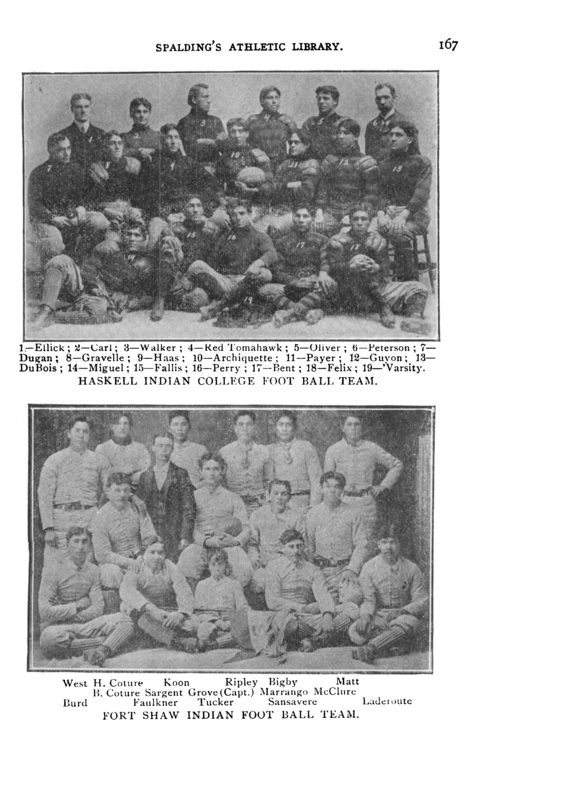 Two schools were singled out specifically: “Carlisle and Haskell Indian Schools, two formerly unclassified institutions, were raised to the ranks of colleges, and students who have competed for four years from those institutions in the future will not be allowed to compete in events controlled by western colleges.” Since Carlisle and Haskell seldom played more than a total of two games a year against the schools that became the Big Ten, this rule was probably aimed at the schools themselves. Several former Carlisle players had played for these schools after having used up their eligibility at the Indian school. Some that come quickly to mind are: Frank Cayou, Illinois; James Johnson, Northwestern; James Phillips, Northwestern; William Baine, Wisconsin; and Ed Rogers, Minnesota. The Native All-Star Football Game is for Native American and Alaska Native high school football players along with Canadian Aboriginals who will graduate in 2010 that are able to prove their Native heritage by holding a tribal identification card from a federally recognized Native American Indian Tribe or a Canadian Indigenous Tribe. Since 2002, this game has given young Native American men the honor to finish out their outstanding high school careers, many of whom go on to compete at the collegiate level, and others who begin new endeavors outside of football. The original idea and concept of the game started with a man named Jeff Bigger. He was the founder of the Native All Star Idea. The first season the two coaches asked to coach in the game were Carl Madison and Herman Boone. 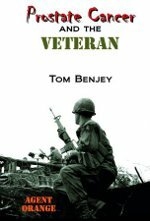 Bigger stumbled across them both as friends of an acquaintance and both were also US Army All American Bowl coaches. Carl was one of the first head coaches in the game as well as the winner of the first Native All Star Game. There has only been one year (2006) where the game was not under the direction of either Jeff Bigger or John Harjo. That year the name of the game was played in Lawton, OK and renamed the Jim Thorpe Indian All Star Football Classic. It pitted former Muscogee (Creek) Chief and former Jenks head coach Perry Beaver up against former Miami of Ohio coach Jim Wachenheim. Perry’s team walked away with the game with a score of 35-0. While the score was lopsided the game seemed closer and was exciting to watch. In 2007 John Harjo retook the reigns of the game and moved it back to Lawrence, KS once again and Haskell hosted the closest ever NAS finish. Dave Brown and his East team won with no time left on the clock with a 2 pt conversion. The final play of the game the running back for the West took the ball back into his own endzone to secure the win even giving Brown and company the safety, but he did not take a knee or run out of the endzone. Quick thinking by a corner from the East took the ball from him tying the game as the horn went off. The play was never called dead and it resulted in a game tying touchdown. Eventual Game MVP and Choctaw Central runningback Joshua Parkhurst punched in the 2 pt conversion and helmets went flying in an unforeseeable upset. 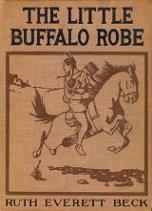 2008-The original 2008 game was to be held on the Soboba Reservation near Hemet, CA. 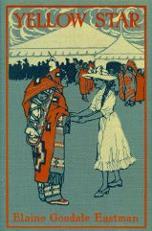 Tragedy and turmoil on the reservation caused game officials to quickly change the location of the game and move it to the home of the Mississippi Band of Choctaw Indians near Philadelphia, MS. Miko Denson and A.D. Walt Wilson were very receptive and helpful in allowing the game to played at Choctaw Central. 6 months of planning and organizing were squeezed into 4 weeks and the NAS Football Game was given new life. Dave Brown held off a 4th quarter offensive explosion by Coach Raymond and company for the victory. In 2009 the head coaches were two former head coaches Bryan Raymond (Cherokee) and Jim Sandusky (Colville). Both coaches lost in previous years and are great coaches and highly competitive. Coach Raymond and the White team’s physical defense held the Red team’s prolific offense to 0 points. Every time the Red’s got near the endzone the White team would tighten up in a bend but don’t break effort by a defense anchored by Matt Billy from McAlester, OK. Billy, who won the Defensive MVP of the game, was also an Oklahoma All-State Selection. To find out more about this year’s game which is being played on July 24 at Bacone College in Muskogee, OK or the game’s history, check out http://www.nativeallstar.com/. 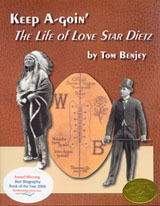 The hands-on Marshall fired Wray, too, and replaced him with William “Lone Star” Dietz, a part-blood Native American. Dietz recruited six football stars from the Haskell Indian School in Kansas, where he had once played with the great Jim Thorpe and later coached for four years. The recruits included “Chief” Larry Johnson, Louis “Rabbit” Weller, and John Orien Crow. The charismatic coach told his players to pose with war paint, feathers, and full headdresses before the 1933 home opener against the Giants. I’ve read this elsewhere but can only verify that he brought four former Haskell students with him—the three Richman listed plus David Ward. They came from Haskell Institute (today’s Haskell Indian Nations University) in Lawrence, KS not Haskell Indian School. There is no record of Dietz ever enrolling at Haskell Institute or playing on their football team. He did coach there from 1929 to 1932. Lone Star Dietz played with Jim Thorpe at Carlisle not Haskell. Jim Thorpe attended Haskell Institute before attending Carlisle but did not play on the school’s football team. What is discouraging is that the author is a veteran journalist and should know that he should have checked his facts. It would have taken him little time to find these errors had he just consulted my biography of Lone Star Dietz and Bob Wheeler’s biography of Jim Thorpe. It is no surprise that yet another journalist has made less than accurate statements about Jim Thorpe and Carlisle Indian School, but it is unfortunate because most readers accept that the author has his facts right and don’t check for themselves.